Calibration Sources In order to determine how radioactively hot a sample is, one must begin by calibrating the Geiger counter from a known radiation source. Detectron provided such a source with each Geiger counter sold. The small red disc contains a small and harmless amount of radium. 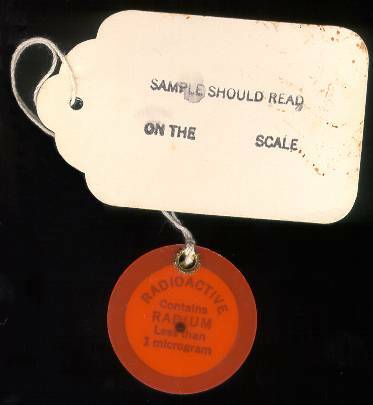 Before leaving the Detectron factory, each disc's radiation level was measured on a precision instrument, and the reading recorded on a tag attached to the disc. The user would then measure the calibration source and adjust the 'counter to show the level recorded on the tag.